Here comes another CCC Multiple Choice Question Paper with Answers (SET-O) in the on going series of CCC Study Material. You can use all the published CCC Question Papers as Sample Paper / Practice Paper SETS or Model Test Papers, in addition these CCC exam question answers can be useful for many other competitive exams too. Prior to make any attempt for the DOEACC / NIELIT CCC Examination, don’t forget to have a look to the latest 2018 CCC Exam Syllabus. Best of luck for your CCC Online Certificate Examination, feel free to check all published CCC practice paper SETS for the better chances to crack the CCC Exam at the first attempt. 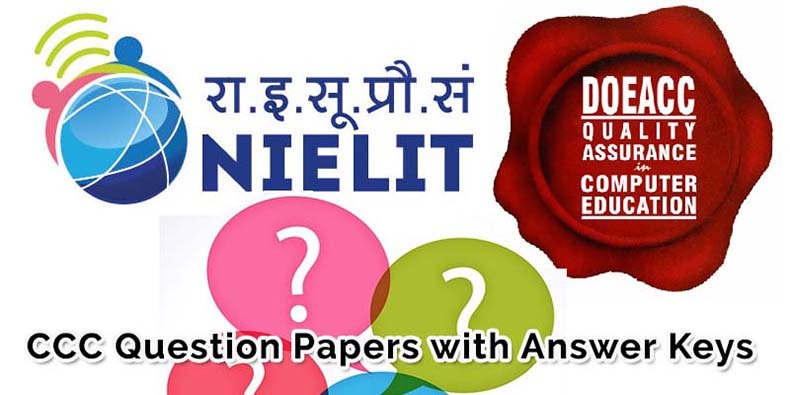 DOEACC / NIELIT CCC Online Exam Question Paper SET-O with Answers – Solved CCC MCQ Sample / Model Test Paper SET-O. CCC Exam MCQ Sample Paper / Question Answer Model Paper SET-O. Note: This CCC Exam Online Question Paper (SET-O) consist of total 50 question with the answers at page no 4 of this post. CCC Previous Year Solved Question / Sample / Model Test Paper SET-O. Ques 1- Which of the cell pointed indicates that you can fill series ? (a) Doctor’s symbol (Big Plus). (b) Small thin plus icon. (c) Mouse pointer with anchor at the top. Ques 4- A default frame relay WAN is classified as what type of physical network ? Ques 5- What constitutes a network ? (a) Two or more computers connected together or share resources. (b) A minimum of three computers connected together to share resources. (c) A stand alone computer connected to a dedicated printer. (d) Two or more computers connected to the Internet. Ques 6- What is a Local Area Network (LAN) ? (a) A small network of shared peripheral devices. (b) A network of connected computers in a single office building or group of buildings at same site. (c) A network of computers connected together across a wide geographical area. (d) A group of stand alone computers in the same room only. Ques 7- Which of the following is the first full color graphical browser ? Ques 8- Web servers and web browsers use …………………… for communicating with each other. Ques 9- Which of the following provides reliable and secured data transfer between two computers but does not provide remote file access ? (a) a computer is linked directly to a network. (b) you can access the Internet from anywhere. (c) you connect to a network through a phone line, television cable or satellite. (d) your internet connection is through a satellite rather than phone lines. (a) socket that enables information to move through a system. (b) hardware device that allows connection to the Internet. (c) peripheral device attached to a computer. (d) space located in the front of a computer to install additional drivers. Ques 15- Which of the following options is used to save the HTML code of a web page ? (c) Web page, HTML only. Ques 16- What is the name of the list that stores the URLs of web pages and links visited in past few days ? Ques 17- It is possible to …………………… a data source before performing a merge. Ques 18- Word has Web authoring tools allow you to incorporate …………………… om Web pages. Ques 19- When typing in Preeti font all the Utkars turn to something else ? What’s the cause ? (d) Preeti font does not work with word. Ques 20- To exit from the resume wizard and return to the document window without creating a resume, click the ……………………….. button in any panel in the Resume Wizard dialog box. You are now on the Page No 1 of this CCC Exam Online Practice Question Paper SET-O with Answers. Complete Answer Keys for CCC Previous Year Solved Question Paper Set-O on Page no 4 of this Post.